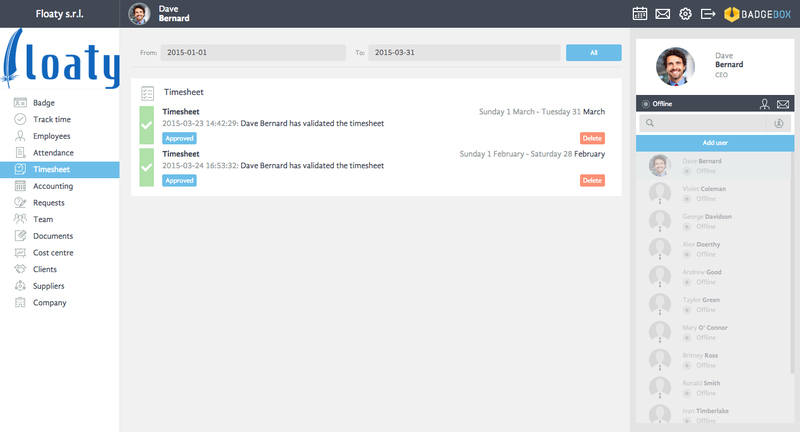 BadgeBox allows you to have control over working hours, sick- leave, holidays and time-off thanks to timesheet generation and visualization. Timesheet is a tabular summary of all previously mentioned data that allows you to automate and improve monthly timesheet drafting. Moreover, thanks to timesheet it is possible to visualize tasks that have been conducted in a certain period of time. In that way, the administrator can know on which tasks or projects a certain employee has been working on. All it takes to generate this spreadsheet, with all working hours and tasks, for a selected period of time, is a tap or a click. Attendance data are available thanks to clock-in /out process that can be conducted via smartphone at the beginning and at the end of a working day. For those who prefer a different way of gathering information about working hours, it is also possible to enable the manual entry mode for attendance data gathering that allows you to insert manually a work time for each day. The manual mode entry can be enabled/ disabled from the section Company. Moreover, it also allows you to do necessary corrections in cases in which there has been a data error. Once created, the timesheet needs to be approved. Timesheet approval process can be generated from the section Company and it is possible to create more approval levels where all or at least one member needs to approve a certain timesheet. Once the timesheet is being approved or rejected, the employee will receive a notification informing him of the approval status. In order to provide you a complete service available in every moment, BadgeBox keeps track of all timesheets storing them for you. Overview function allows the visualization of all timesheets related to a specific period of time and their status. This means that from here, the administrator can see if a certain timesheet has been sent for an approval of not. There is also a possibility to contact directly a specific user in case of a need.